More and more Big Local communities are appreciating the importance of research — to gather evidence and make a case for improving public services, to challenge assumptions about their place, or to help them with the evaluation of their Big Local plan. We`re seeing increased interest in linking up with universities and research organisations that can offer support and training. By the same token, trained researchers are often interested in working with communities to explore specific issues and increase the impact of their research. At a NCVO research conference in Nottingham, Local Trust and Big Local Blackpool Revoelution presented a workshop on community-led research. In a few Big Local areas, we have seen some inspiring collaborations between communities and researchers. How can we ensure everyone feels valued and in control and we produce good research that has positive impact? 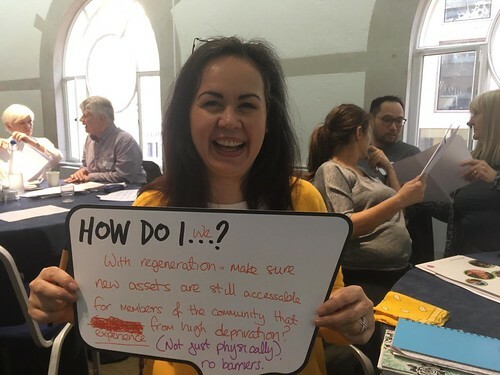 We thought the NCVO conference would be a good forum to explore these issues, with Big Local residents as well as not-for-profit organisations and academics. Academics and practitioners often talk about communities at these conferences, yet community views are often filtered by the organisations working with them or studying them, and hardly ever represented directly. We feel that it`s really important to open up more spaces that can facilitate a dialogue between citizens, academia and practitioners, to learn about and from each other and do research together in a way that is useful to everyone. How do we ensure communities are in control? How do we identify the right partners? Where do we start? How do we address key challenges, such as differences in language, expectations, priorities, admin requirements and resources? There is a lot to learn from research but we have to make sure it is accessible to all and genuinely inclusive. Language should be clear and concise and all materials should be available in multiple formats. Looking at other resources and research that has already been conducted could save time and effort in the long run. Our questions may have already been answered elsewhere, so check Census, local councils and government departments for facts and data. A partnership is about relationships and it is important to find partners with similar objectives. Expectations need to be voiced and managed early on in the process to ensure no crossed wires. Researching takes a lot of time and effort so coming together and creating a mutual agreement, with clear focus and timeframes, ensures both sides are communicating effectively and working towards a clear, common goal. Do your research before your research! Finding the right partners requires time, patience and effort. Whether you are a community researcher, academic or community practitioner, identify the existing community skills and resources and tap into those. Finding the right partners is just the beginning. Once partnership are established, it requires constant communication and engagement to work through challenges. We discussed tools we could develop together to share learning and resources (without reinventing the wheel — the world is full of toolkits!). The key learning is that we need to be clear upfront about what we want to research and why, what each side can offer and what we expect. We want to continue the conversation. One place to start is our Facebook group on Big Local Research — you can share thoughts and ideas and also network with Big Local areas and trained researchers. See you there!